He graduated from the School of Arts in 1901 and in 1906 went on to study at the Munich Academy. 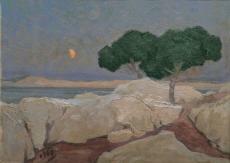 He lived in London for two years,returned to Athens in 1910 and began to show his work in exhibitions. He was a founding member of the ‘Techni’ group of artists (1917). Heparticipated in the Venice Biennale (1934, 1936). He was director at the Athens School of Fine Arts annexes on Hydra and in Delphi.His favourite subject matter includes scenes of everyday life, war subjects and animals; his landscapes and outdoor scenes echo Impressionism,in a departure from the academic climate of Munich.